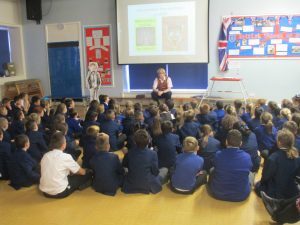 Two author assemblies were booked in for early October: one in Accrington and the other in Fleetwood. The first stop was Spring Hill Primary in Accrington. It was nearly a year since my last visit and it was lovely to return. The Y2 – Y6 pupils discovered how Danger Zone was created, from the initial plan to the final draft. 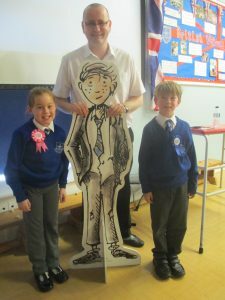 They saw examples of Martin’s magical illustrations and even got a mini masterclass in drawing Eric! 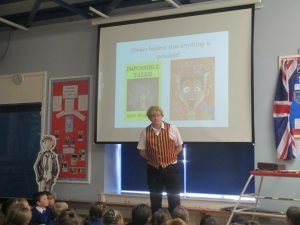 To finish the session I put on the storytelling waistcoat to tell one of the Tales from More Impossible Tales. It went down a treat! My second assembly visit was closer to home in Fleetwood. 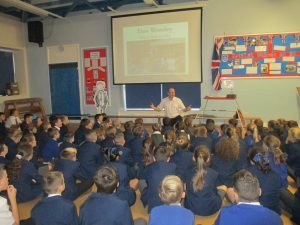 I’ve visited St Mary’s Catholic Primary many times stretching back to the original Impossible Tales. It’s always a lovely place to visit. The children found out all about Eric’s new adventure and I even managed to finish the session in time for the lunchtime staff to set up the hall! Always important not to upset the most important people in the school!! I enjoyed my time in both schools and would like to thank Mrs Hornby and Mrs Sewell for organising the sessions and the accompanying book signings.